Father’s Day themed Cupcakes There are 13 products. 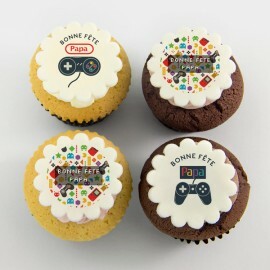 These Happy Father's Day gaming cupcakes on marshmallow fondant will bring fun and magic to your table. 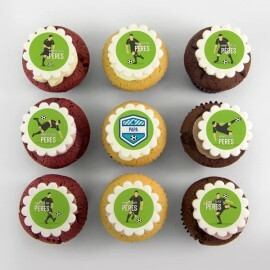 These personalized cupcakes with sports illustrations on marshmallow fondant will bring fun and magic to your table. They will score high on the dessert table! 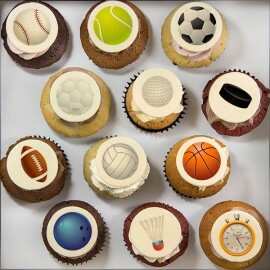 These cupcakes with sports illustrations on marshmallow fondant will bring fun and magic to your table. Father's Day cupcakes with golf illustration. 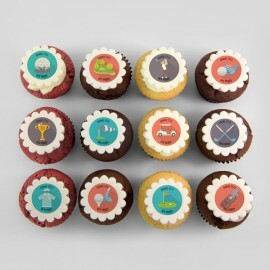 These cupcakes with golf illustrations on marshmallow fondant will bring fun and magic to your table. These cupcakes with tools illustrations on marshmallow fondant will please your handyman dad. Looking for a sweet gift for a gambler? Our “casino” pure butter cupcakes decorated with chips, playing cards, slot machines or dices made of marshmallow fondant will assure you to win! You want to celebrate a nature lover or a camper? Nothing could be funnier than offering pure butter cupcakes decorated with a tent, hiking shoes, flashlights or backpacks made of marshmallow fondant! Would like to have cupcakes for a little boy’s or girl's birthday party? Our pure butter cupcakes with car illustration on marshmallow fondant will please everybody! Looking for a sweet gift for a photo lover? 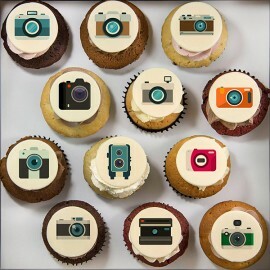 Our pure butter cupcakes decorated with cameras from all time, on marshmallow fondant will assure you to flash! You want to celebrate a gardener? Nothing could be funnier than offering pure butter cupcakes decorated with plants, flowers, and gardening tools made of marshmallow fondant!